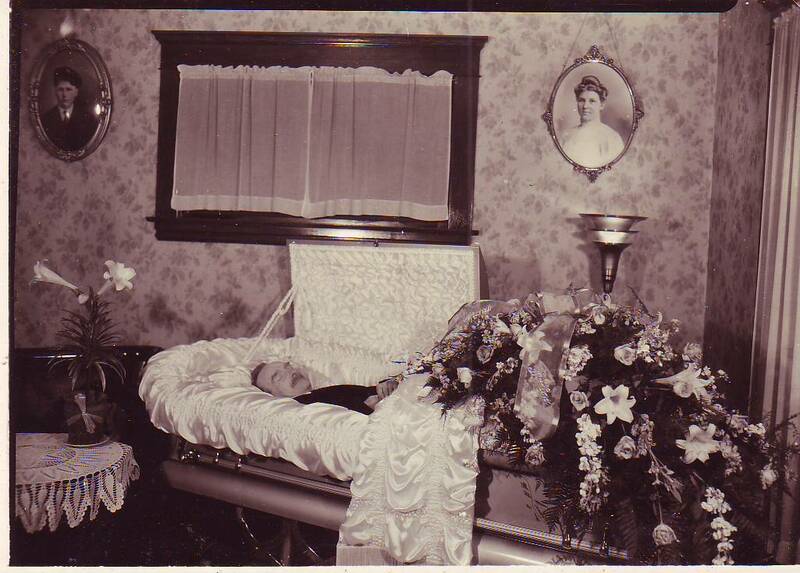 Due to the fact that the family moved to San Francisco, California, after the death of husband and father Henry S. Fitzgerald, I will begin my search in the California Death Records available at Rootsweb. Boys are usually the easiest because their names don’t change upon marriage. And this holds true in this case. “Harry Armour Fitzgerald” appears in the death records of San Francisco. His birth date is reported as 29 May 1877.1 For me, the middle name is a clear indication that this is the guy I want. Even if the birth year might have been reported incorrectly (since in 1880 he was reported as born abt 1875), this is pretty close! Luckily the California Death Records include the surnames of parents. A search for all people whose certificates recorded “Fitzgerald” as their father and who were born in Arizona returns a record for a “Tillie M. Menteer.”2 She was possibly originally a Matilda “Tillie” Fitzgerald. The certificate reports her mother’s maiden name as “Moore” — a match to our Mary Ellen who seemed to have adopted her step-father’s surname as her own. The only problem is that the record reports her birth as 19 Mar 1886 — a full eight years too late. But, again, knowing the likelihood of errors in reported birth dates on death certificates, I did not throw out this result. Instead, I tried to verify the last name “Menteer” as possibly belonging to a woman who was born in either 1886 or, as I suspect, 1878. A census search for women living in San Francisco who were born in either year in Arizona returned no Menteers — only a “Tillie Swasey.” By 1920, this woman is divorced, so she could be our girl as she still could have married Menteer later. Okay, now back to Google. A search for the words — tillie swasey fitzgerald — turns up a index record for a marriage license which ran in the San Francisco Call. Based upon this find, I am fairly certain that Matilda (Tillie, Matheal) married first a William Swasey and later a Menteer. The month and day of birth match in both the death record and Swasey Genealogy, and since it doesn’t appear that Tillie ever had children, who knows who the informant was on her death certificate. Now that I have been feeling successful for two of the children, I will tell you now that all of my hopes have been dashed when trying to research the last daughter, Anna. You might remember (Ok, probably not, so I’ll remind you) that Mary Fitzgerald had a grandson named John or Jack Spiro. So I began with him — yes, even though he is outside of my project definitions. (Matilda was married to Swasey during this time, so the child was likely Anna’s.) Jack’s California death birth reports him as having a mother whose maiden name was McVeigh.5 His death record reports his mother’s name as Fitzgerald.6 How could it be both? Either way, there are no identifiable death records for an Anna Spiro or an Anna Fitzgerald about the time of John’s birth. A quick review of our normal resources for news articles (genealogybank.com and newspaperarchive.com) don’t return an obit for John or Anna Spiro. Nothing obvious pops on google with searches for a combination of the words: john, newburn, spiro, anna, fitzgerald. Could it be that Mary DID remarry after her husband’s early death in 1880 — and Anna was using the surname of her new father at the time of the birth of her child John? Thereby explaining how John’s records read McVeigh and then later Fitzgerald. It would seem that there was some sort of falling out between Mary and her second husband because by 1910 she has gone back to using the surname of her first husband. Well, as you can see, the search for Anna only raised more questions. Search for Mary Ellen McVeigh in the 1900 Census. 1. “California Death Index, 1940-1997,” database, Ancestry.com (http://www.ancestry.com : accessed 19 Jan 2009), entry for Harry Armour Fitzgerald (15 Feb 1947); citing State of California Department of Health Services, Center for Health Statistics. 2. Ibid., entry for Tillie M Menteer (30 Mar 1953); citing State of California Department of Health Services, Center for Health Statistics. 3. Jim W. Faulkinbury, CGRS, The San Francisco Call Database (http://cefha.org/usa/ca/sf/sfcall/sfcall0.html : accessed 19 Jan 2009); entry for W.N. Swasey to Tillie M. Fitzgerald, 1897. 4. Benjamin Franklin Swasey, Genealogy of the Swasey Family (Cleveland, Ohio: Privately Printed, 1910), 460-461; digital images, Google Book Search (http://www.books.google.com : accessed 19 Jan 2009). 5. “California Birth Index, 1905-1995,” database, Ancesty.com (http://www.ancestry,com : accessed 19 Jan 2009), entry for John N Spiro (14 Jul 1907); citing State of California Department of Health Services, Center for Health Statistics. 6. “California Death Index, 1940-1997,” entry for Jack Newburn Spiro (12 May 1980). 7. Faulkinbury, The San Francisco Call Database; entry for John N. McVeigh to Mary E. Fitzgerald, 1886. Very impressed with what you have gotten so far. I am researching Jennie Fitzgerald who is living with the H. S. Fitzgerald family in 1880 in Yuma as the niece. Jennie says that she is born in OR abt. 1866 and her father ENG and mother OR. I cannot find her in 1870 anywhere!! Do you know anything about the Fitzgerald line? What happened to Henry S. Fitzgerald, b. 1844 ENG? Do you know who his brother might have been in OR in 1866? Hi, Val, thanks for the compliment! I don’t know much about the Fitzgeralds because they are outside of my research focus on the Scholefield Family. Therefore, I don’t know the names of his siblings, but check out the Liverpool area in the 1851 Census, immigrations about 1853, and New York in 1860 (Henry enlisted in New York City in Oct 1861 — of course that would mean Henry was in the second battle of Bull Run, not the first as some suggest).